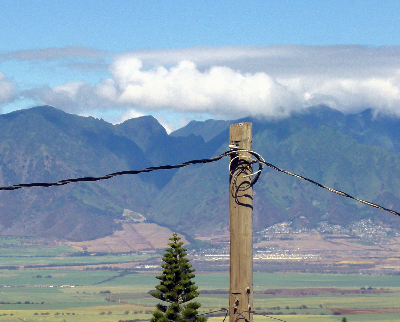 Julie Galeeva has a gallery on the main corner of Makawao and on her back porch in Pukalani is this great view of the West Maui Mountains. A Hawaiian Queen laying down, head and bust, can be seen from this 2,000 elevation Pukalani view, but I'm only seeing part of the mountain. Here's a different view from Poli Poli at 7,000 elevation where you can see the King and Queen. Magic Maui Mountains drawings to color in. 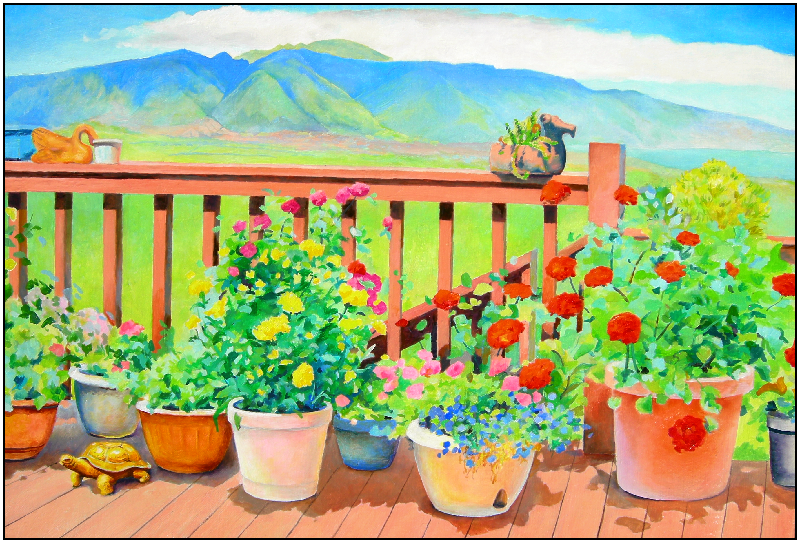 When Julie and I had decided to paint a location painting together and she suggested her porch was out of the wind, off we went. My painting is a 9am to 12pm but for 3 days I've been working till 4pm. 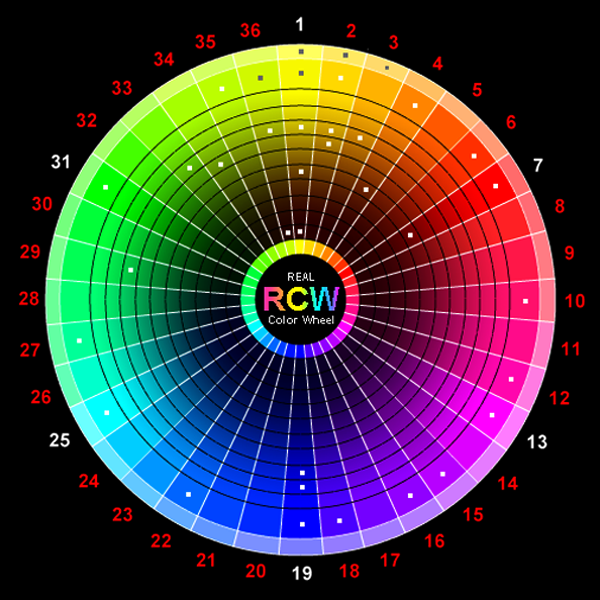 I've been fairly careful about not adding any new colors after 12. 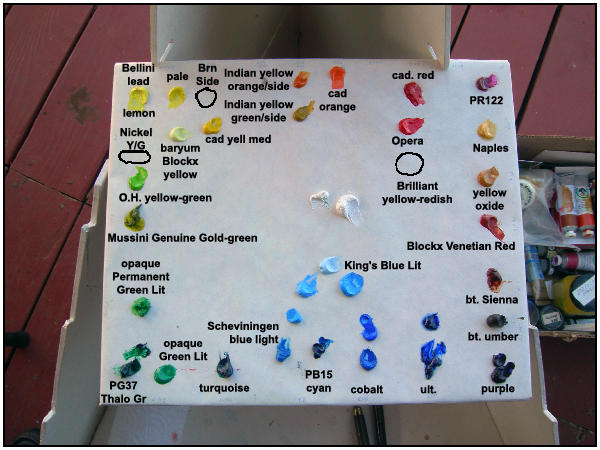 This is my full oil palette on freezer paper. Day 1, the drawing in ult. blue. Day 3, 9-6-10, 100% covered. The barometer has been moving the bottom of the clouds up and down, today for the first time I saw the Queen's hair peak and knew I had a special painting, even if I never get to see the King behind her. The turtle is Indian yellow org/s, perfect for the gold. I have the clouds shaped now. 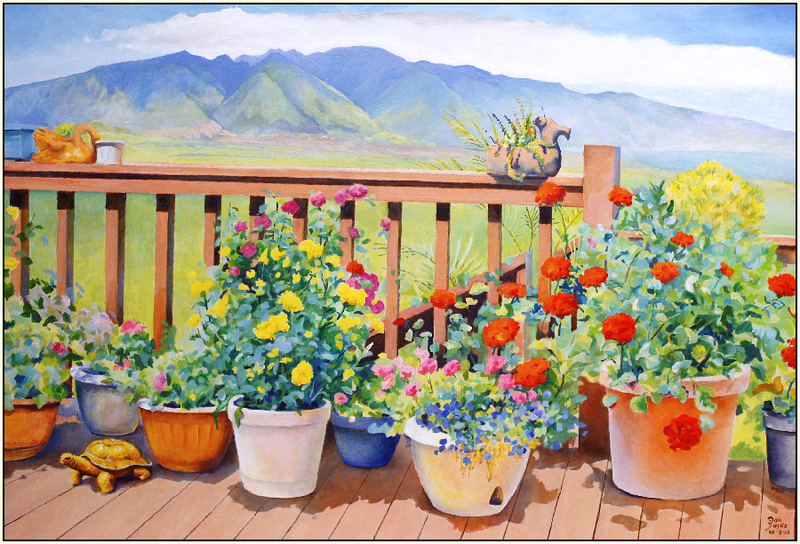 The very bright red flowers are made with Opera and Indian yellow, it's brighter than cad red. 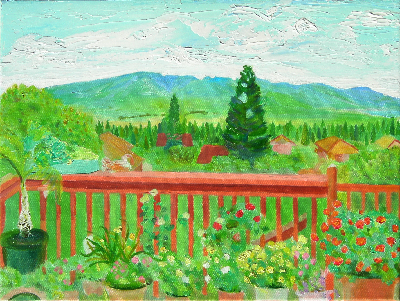 The big center pine tree is now gone so I can show the Queen in the Mountain. It didn't bother me the first day because the clouds were lower and I couldn't see the Iao Valley or the Queen. This is a detail of the Queen. 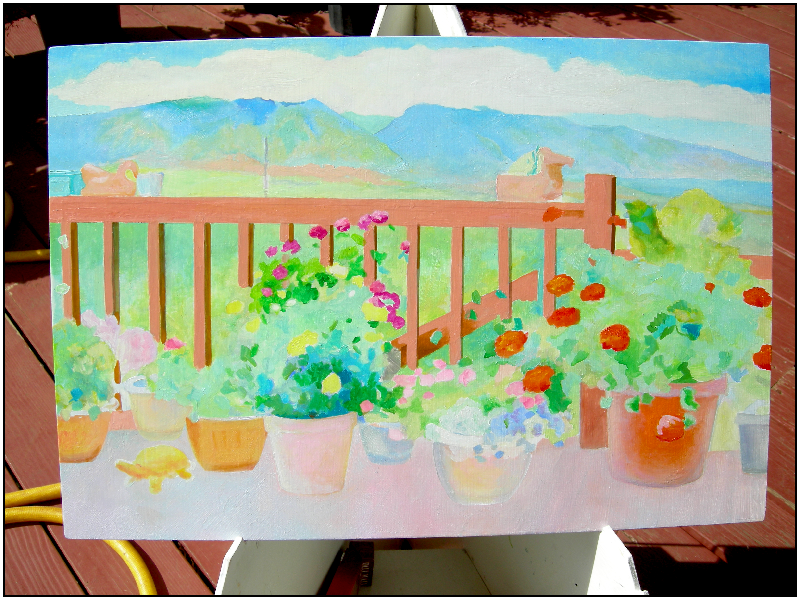 The colors will change as I only had a few minutes to paint her in before the clouds lowered again. The next day was not completely sunny but I got a full day in anyway. Most of the railing is finished and I started with some sun shadows on the deck. I'm still not sure about the view of the queen but I darkened mountain. The next day I almost saw the whole mountain. the clouds are massive by 9Am. 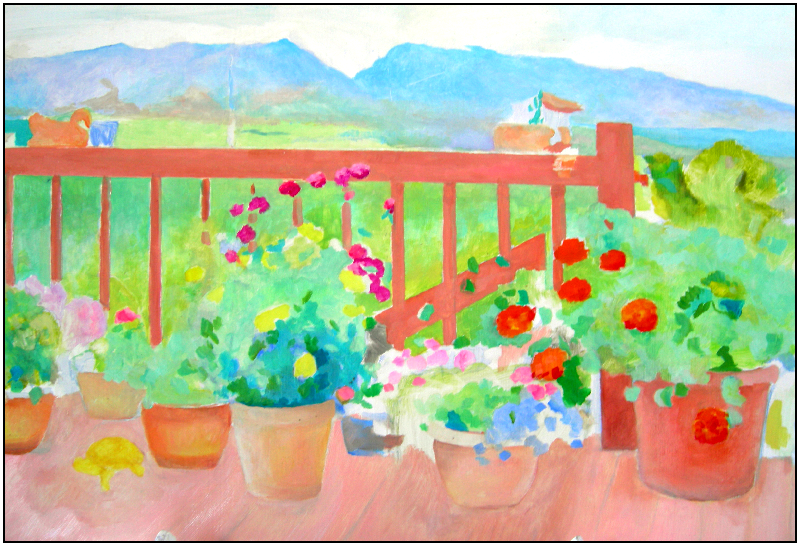 I changed the painting to a sunny deck from later in the day, my painting time moved 10Am to noon. Julie's such a good host, this is a fun painting. I hope I remember the railings top edge to paint in tomorrow. 9/9/10. Julie has a 17 year old son named Nikita and he's got a great start. Look at the detail in his image and drawing by scribing in the paint. He's not finished yet, the railing on the far left is wrong perspectively. That's happening because he's not painting with the view above the canvas. The next time the Queen showed up I was ready with my camera. There was no sun today so I cleaned my edges, soothed blends, and cleaned off the location dirt. I think the painting will sit over the weekend to dry. I took it home with me to work on and dry. I cleaned it and today I was painting and the clouds kept rising, I'm confident I will get to see both the male and female from this location. At the end of the Sleeping Giant is his big toe, bravely protecting the coast from the treacherous and unrelenting trade winds. This Kahakaloa Head is amazing, it looks like an elephant filling the ocean all day from his trunk. It looks correct from all angles. I wonder if the goats are still on it? I have to clean off the Pukalani wind-blown grit before tomorrow's session. I did get some work done to the flowers today. Today is 9/15/10. Another day of painting, I'm cleaning and blending now, the mountain is ready. Tomorrow will be a day off to dry. Today is 9/17/10. It is now 12:48 AM. Eight pots left to right, #2 has a flat bottom, #3 uneven sides, #5 glaze in shadow colors, #6 flat bottom, #7 leftbottompoint. Either lighten the queen or darken the rest. Darken board deck lines. Perspective to cyan left railing pot. The next morning I water washed the painting and it was dirty. Well it should have been, I've been crawling all over it for a while now. I'm all caught up now, ready for Monday morning. I'll work on my 4 Protea in 3 Colors, water color tomorrow. 9/21/10. This is the first day I could see (most of) the Sleeping Giant for about 30 minutes. 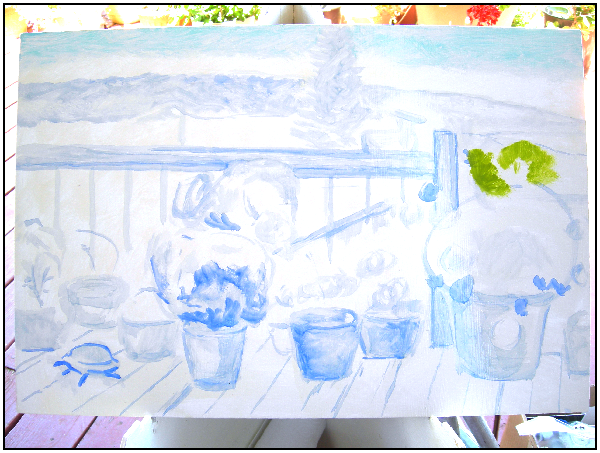 The rest of the day I worked on the flowers, took some of the blue pot's blue with a wash of bt. Sienna and cleaned up the gold turtle with white and added the green from some corrosion. 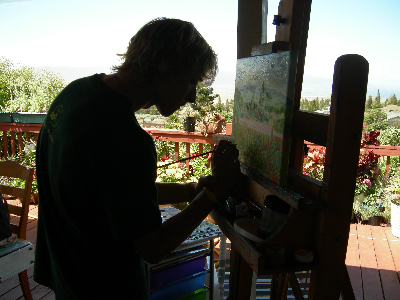 9-22-10, I got another day in, darkened the deck with translucent vermillion, worked on the turtle and the flowers. The mountain was cloudy most of the day. 9-23-10, It's very close to the end. 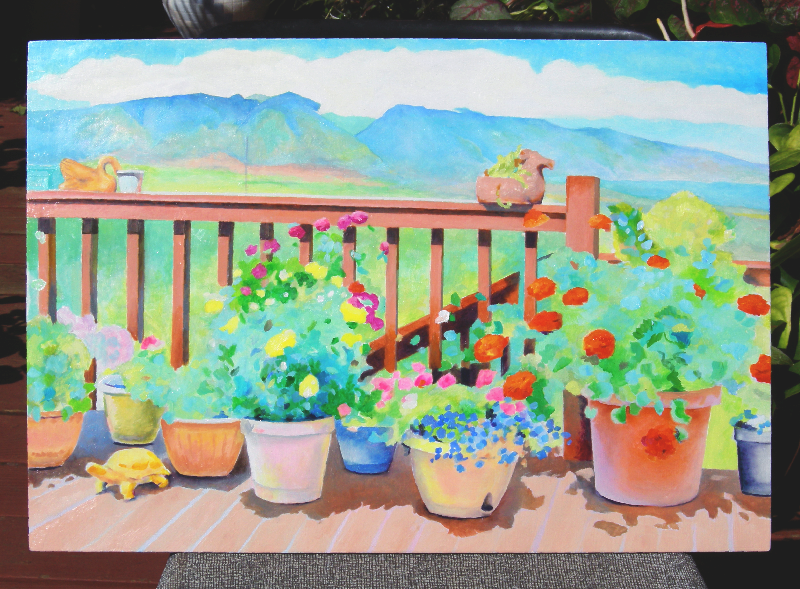 I have to deepen the deck shadows. Behind the main railing is the is a potted palm, the drawing of it is made with white chalk which is in this photo. If this was acrylics, which is a lot faster than oils, the chalk would be long gone and wiped off. But as it is I have to wait until it's dry. 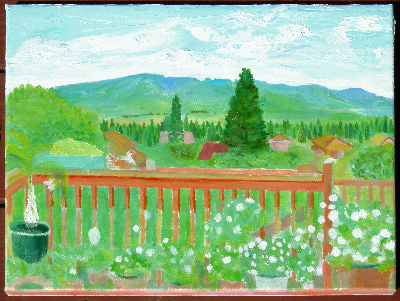 The medium for this painting is Galkide Light which dries within 10 hours. 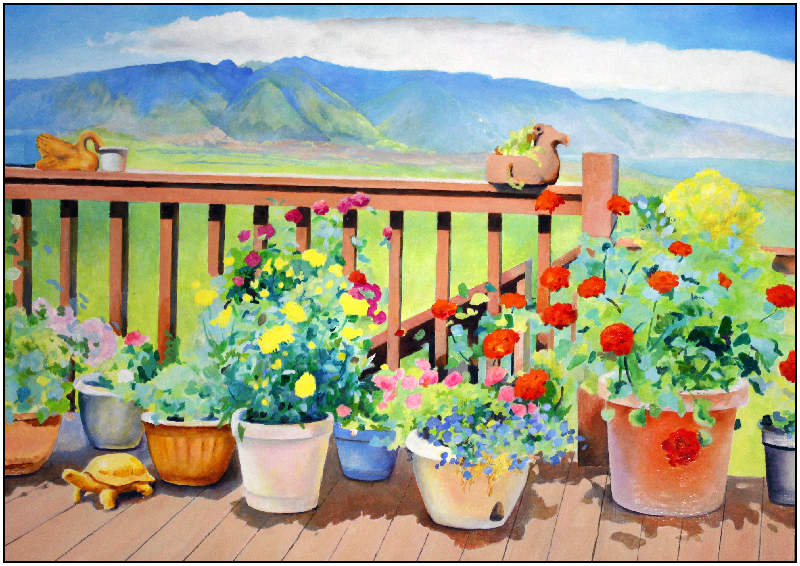 The potted plants need some big strokes of solid leaf color for the eye to rest in. 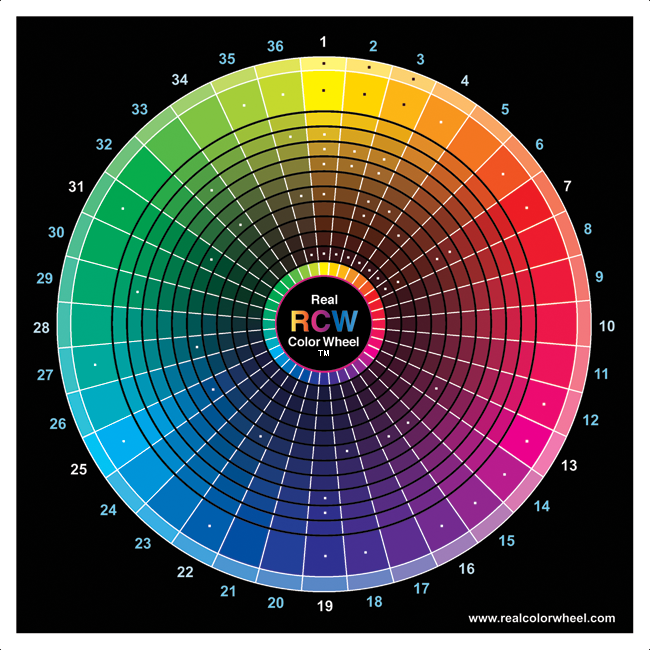 The time of day I choose this color is very important. And if I never see the top of the mountain again I'm not sure what I'll do. 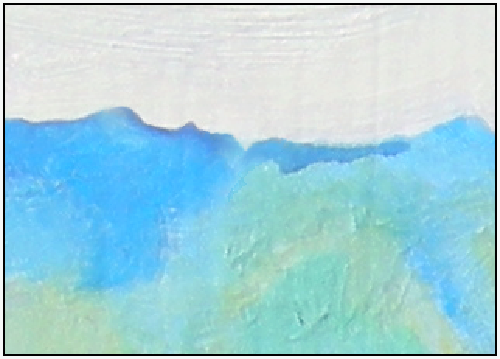 TIP: add the alkyd to the white on the palette, that way any color added to the white will have some drier in it. 9/29/10. It's finished, I just have to clean up some edges now. I got the mountain top by making a montage of the photos Julie's husband John shot for me early in the morning. TIP: Use your best painting turp. Use a Silicoil Brush Cleaning Tank with a cleaning coil at the bottom. Rubbing the coil loosens the paint in the brush. Cover the coil with a 1/4" of painting turp. As a cleaner it will settle overnight and be clear for the next day. Squeeze your brush hairs, don't pull them. There are a lot of changes on the final painting. I tested Opera in the red flowers, the gold turtle always was Indian yellow, the pots got new bottoms, but mainly the tops of the mountain. That little 1" strip took a lot of time. 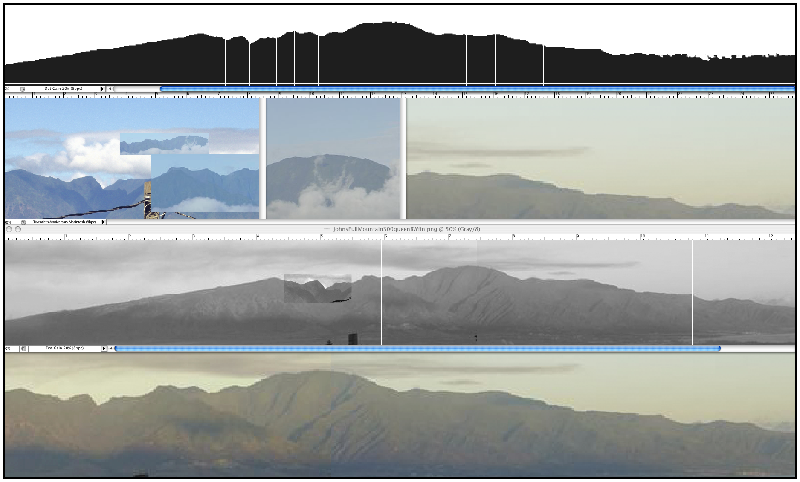 Here is the photo montage I used for the tops of the mountain. 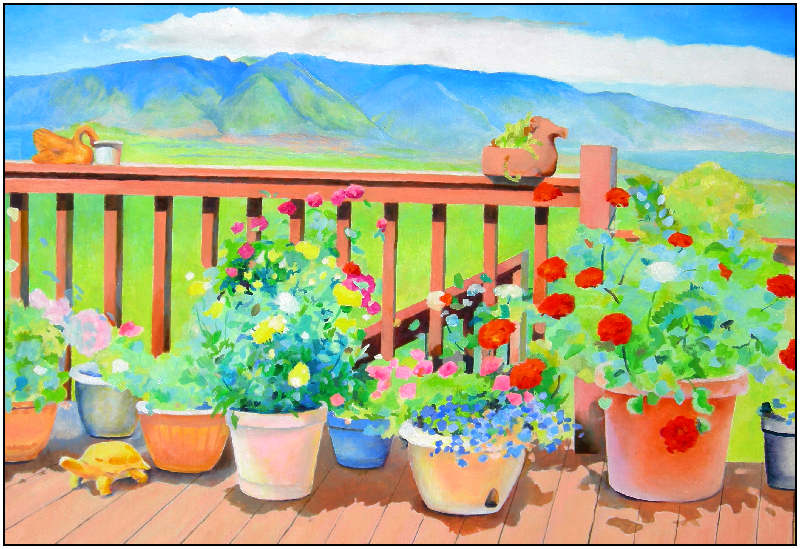 This whole painting has used Julie's Gamblin's Galkyd as the medium. During my correcting, cleaning, regulating the texture and filling my holidays (empty spots) I think I noticed something. Mass colors don't stick when dry over other Galkyd colors, They flake off when handled roughly, and I sand and scrape. Pure tube color and turp doesn't stand a chance over the slick Galkyd. I never noticed that from my own alkyd dilution in turp that I disperse with an eyedropper but they didn't get any rough work done to them like these did. I'm going to final coat the painting with Gamblin's Gamar 2-part Varnish, I hope that locks it all in place, it's a gamble. 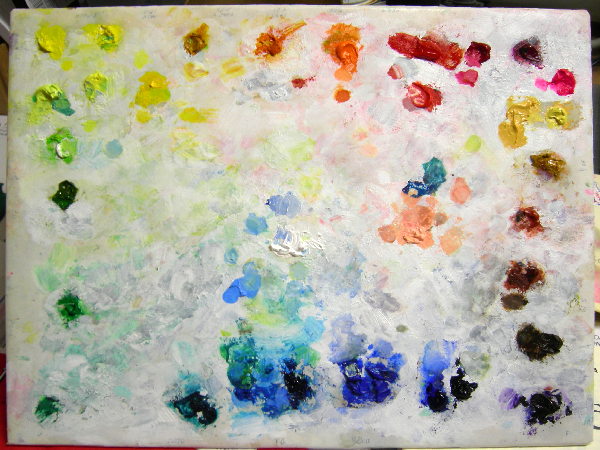 This is what my palette looked like when I was finished painting. That painting took soo long, I wanted to paint a fast painting. 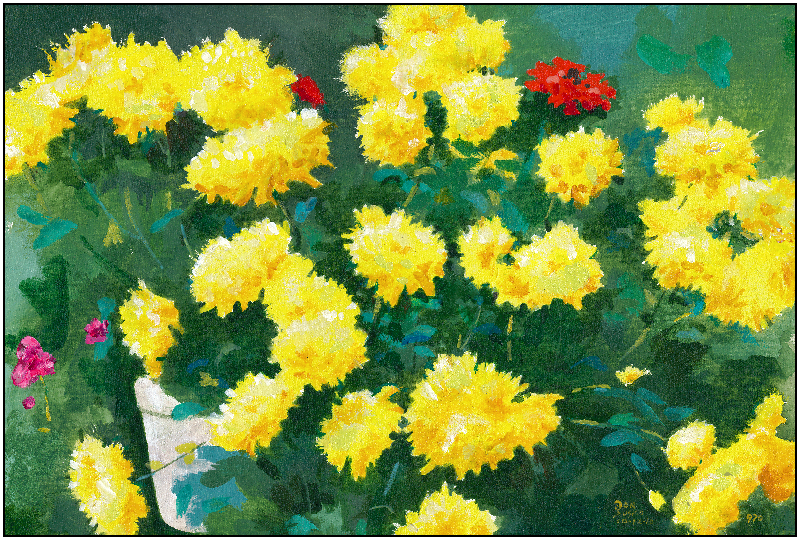 These are the yellow flowers, 11x7.5 oil. The flowers are all dual-toned Indian yellow including the darker parts. Carrying The Flag of Realism Many individuals are carrying the flag for realism, with the unified purpose of seeing it discovered by the art world. They are fighting against great odds in a world where realism has been pooh-poohed as nothing more than "pretty pictures." Yet this new, energy-filled movement is not about repeating the past but about creating a new future, rooted in deep traditions. It is being embraced by youth, who find it new and refreshing, and who are teaching others, opening ateliers, and breathing new life. Painting from life. This is only a 72dpi, for a 300dpi email me.